Reefing Hook - Mount this hook under the Tack Shackle for quick reefing - hook the reef tack under this hook. The base is 1/8" thick and 1.5" x 0.75". The two hooks are made from 1/4" dia. round stock. The mounting hole is 1/4" dia. There is a little more than 5/8" between the parallel parts of the hooks. 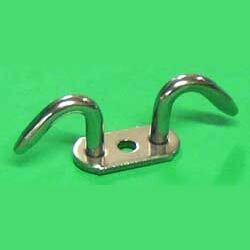 Note: A longer clevis pin may be required when adding this hook to a Racelite gooseneck.